Actions: Enhances cellular metabolism and energy production. Activates biosynthesis of collagen and elastin by dermal fibroblasts. Promotes enzymatic activity to boost collagen maturation. Helps maintain youthful functions. Formulated with Cellular Water which restores the skin's natural life potential. Instantly works to boost surface microcirculation, plumping up the skin and smoothing the features. Results: After the first few says the skin is visibly more youthful. Repair continues! Instructions for use: One bottle is for a three week intense treatment. Use as a serum combined with any repairing moisturizer. 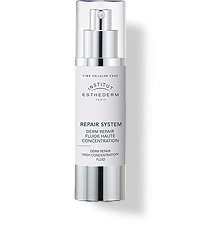 For an even more intensive treatment combine with Restructuring Repair Cream as your morning and night moisturizer. Both Am and PM apply the Restructuring Repair Cream just after the Derm Refiner and gently rub them together in application. This intense treatment is unsurpassed. Truly wonderful to treat yourself to this intense cure 2x a year!